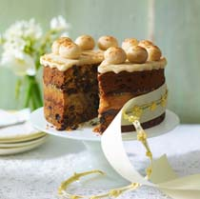 This traditional simnel cake is spicy, moist and fruity, with delicious marzipan running through the centre and over the top. Mix all the dried fruits in a bowl with the liqueur and leave to stand for 1 hour. Grease and line an 18cm cake tin with non-stick baking parchment. Preheat the oven to 150°C, gas mark 2. Put the butter, sugar and grated ginger in a large bowl and beat well until pale and creamy. Gradually beat in the eggs, adding a little of the flour if the mixture starts to curdle. Stir in the flour and spices, then the dried fruit with any juices left in the bowl. Mix well. Using about a quarter of the marzipan, make 11 oval balls, about the size of a mini egg, and set aside. Shape half of the remaining marzipan into a ball and roll out onto a surface dusted with icing sugar to an 18cm circle. Spoon half the cake mixture into the tin and spread in an even layer. Lay the paste over the cake mixture, pressing it down gently. Spoon the remaining cake mixture on top and spread with the back of a spoon. Bake for about 2 1/4 - 2 1/2 hours or until a skewer inserted into the centre comes out clean. Leave to cool completely in the tin. Transfer the cooled cake to a baking sheet and brush the top with the ginger syrup. Roll out the remaining marzipan as above and press down onto the top of the cake. Pinch decoratively around the edges. Arrange the marzipan balls on top, sticking them with a little extra syrup from the jar. Heat the surface of the cake under a moderate grill for 1-2 minutes, watching closely, until the marzipan starts to toast. If one area turns too dark, cover it with foil. Transfer to a plate or cake board and dust lightly with extra caster sugar. Or to wrap, cut a large circle of clear Cellophane. Position the cake plate over the centre and bring the sides of the Cellophane up over the cake. Squeeze the edges together and secure with ribbon. Alternatively, put the cake, on its board or plate, in a small cake box (available from cake decorating shops), or in a gift box. Watch our video on how to line a cake tin.